Cisco has a huge number of enterprise clients in the corporate environment. Therefore many network engineers should draw network diagrams for Cisco hardware. that facilitates drawing at the initial stage. However for customizing Cisco network diagrams you can use 10+ Libraries like this: Cisco Basic, Cisco Buildings, Cisco IBM, Cisco LAN, Cisco WAN, Cisco Media, Cisco Optical, Cisco People, Cisco Routers, Cisco Security, Cisco Switches&Hub, Cisco Telepresences, etc. 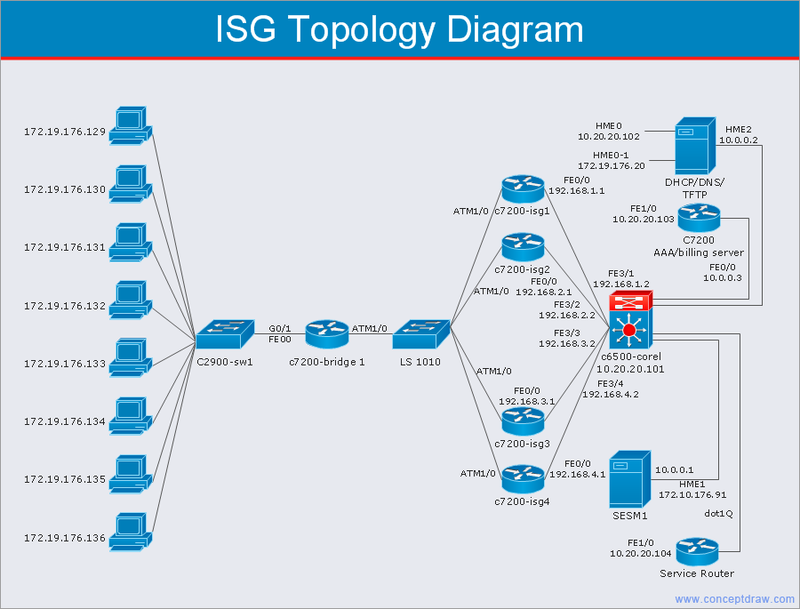 This take great advantage to you for designing Cisco network diagram templates. This Cisco network diagram template is created using ConceptDraw DIAGRAM diagramming and vector drawing software enhanced with Computer & Networks solution from ConceptDraw Solution Park. Computer & Networks solution provides symbol libraries Cisco Basic, Cisco Buildings, Cisco IBM, Cisco LAN, Cisco WAN, Cisco Media, Cisco Optical, Cisco People, Cisco Routers, Cisco Security, Cisco Switches & Hub, Cisco Telepresences. Computer & Networks solution also provides templates: Wireless mesh network, Network organization chart, Roaming wireless local area network, Cisco ISG topology diagram, Cisco express forwarding sample, that facilitates drawing the network diagrams.